Data Solutions & Technology Incorporated (DST) was founded in 1994 by Deborah Scott Thomas. Located outside of the Nation’s Capital in Lanham, MD, DST provides a full spectrum of Solutions in Information Technology, Logistics & Operations, Management Support, and Scientific & Technology. DST provides support services to state and federal agencies as well as private industry clients by helping them to successfully manage, staff, develop, and operate their programs. As president and chief executive officer, Ms. Thomas provides leadership, supervision, and program direction for all phases of business development from identification of opportunities through satisfactory completion of a customer's requirements. The company's clients include a who's who of federal agencies to include: Defense Logistics Agency, Defense Intelligence Agency, Defense Information Systems Agency, U.S. Army, U.S. Marine Corps, U.S. Navy, U.S. Air Force, Drug Enforcement Agency, Department of Energy, Department of Treasury, and National Oceanic and Atmospheric Administration. Deborah Scott Thomas' philosophy is “Vision of Excellence,” which is based on making customer satisfaction her number one priority. As a result, DST has more than 425 employees. Deborah Scott Thomas is a native of Montgomery, Alabama. 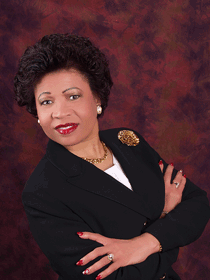 She graduated from Alabama State University (ASU) with a bachelor of science in accounting and management in 1974. She received her United States Air Force commission as a second lieutenant from ASU's Detachment 019 in 1975. She earned a master's in public administration in 1977 from Webster University in St. Louis, Missouri. Ms. Thomas retired as a colonel from the United States Air Force Reserve, having served her country for three decades. She has worked for Fortune 100 companies as well as small businesses. She is a recipient of numerous awards and recognitions including: the U.S. Minority Business Development Agency's National Abe Venable Legacy Award for Lifetime Achievement award; the Black Engineer of the Year (BEYA) STEM Trailblazers award; the Greater Baltimore Committee’s Bridging the Gap Achievement Award; the National Black Coalition of Federal Aviation Employees (NBCFAE) Eleanor J. Williams Bronze Eagle Award; the MEA Magazine’s 50 Women of Power in Business; the Legacy of Leadership Award from Spelman College; the Lifetime Achievement Award from The Center for HBCU Media Advocacy, Inc; and the Distinguished Hornet Entrepreneurial Award from the ASU National Alumni Association, Inc. Philadelphia Chapter. She was also the first recipient of the Silhouette of Service Award from ASU’s College of Business Administration and she was named one of The Network Journal’s 25 Influential Black Women in 2011. Ms. Thomas is married to Oatice Thomas, president and CEO of Operations & Technology Incorporated, and has three sons: William Scott, Darius Thomas and Duncan Thomas. The fifth of seven children, Ms. Thomas has three brothers: Willie Fred, Jim Lamar and Charles Jefferson Duncan; and three sisters: Mary D. Stallworth, Ida D. Sankey and Cassandra D. Duncan. Her mother, Mrs. Mary Ann Duncan resides in Montgomery, Alabama.